Last week brought more volatility to the markets. While domestic indexes had some rallies as positive trade news emerged earlier in the week, by Friday, December 14, they had erased any gains. 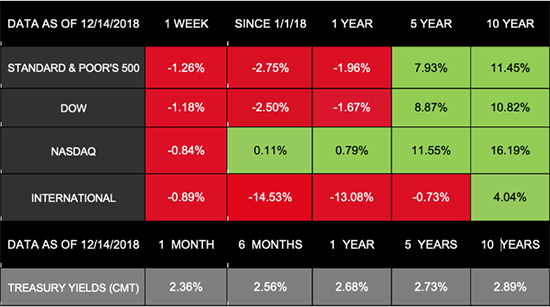 The last time major U.S. indexes ended in correction territory was March 2016, meaning they are now at least 10% below their highs from the past year. For the week, the S&P 500 dropped 1.26%, the Dow lost 1.18%, and the NASDAQ declined 0.84%. International stocks in the MSCI EAFE also had a 0.89% weekly loss. Why did markets struggle last week? With last week’s declines, the S&P 500 was in the midst of its worst December since 2002. Concerns about global growth fueled much of the declines as China and Europe released economic data that missed projections. The ongoing trade tension contributed to slower growth in China, which drove some investors to worry about U.S. growth, as well. We did, however, receive solid domestic data last week, including a healthy retail sales report. But, through the week, investors seemed less interested in this data and positive trade updates, focusing instead on understanding the global economy’s standing. What might be ahead? This week presents a potentially significant event for domestic markets: the Federal Reserve’s commentary after its latest meeting. The Fed will likely raise interest rates during the meeting, which would be the 9th increase since December 2015. Markets expect this hike, but what investors aren’t sure about is how the Fed will describe its plan for 2019. Some analysts believe that if the Fed indicates it will pause or slow rate hikes next year, we could see a sizable “Santa Claus rally” through the end of December. For short-term traders, predicting whether 2018 will stay in negative territory or stocks will end the year on a surge is in many ways a guessing game. What we are here to do is help you manage your investments for the long term. We will follow this week’s developments closely and strive to determine how they may affect the economy going forward. Ultimately, we are focusing on your goals not just through the year, but for the rest of your life. Diversification does not guarantee profit nor is it guaranteed to protect assets. International investing involves special risks such as currency fluctuation and political instability and may not be suitable for all investors. The Standard & Poor’s 500 (S&P 500) is an unmanaged group of securities considered to be representative of the stock market in general. The Dow Jones Industrial Average is a price-weighted average of 30 significant stocks traded on the New York Stock Exchange and the NASDAQ. The DJIA was invented by Charles Dow back in 1896. The Nasdaq Composite is an index of the common stocks and similar securities listed on the NASDAQ stock market and is considered a broad indicator of the performance of stocks of technology companies and growth companies. The MSCI EAFE Index was created by Morgan Stanley Capital International (MSCI) that serves as a benchmark of the performance in major international equity markets as represented by 21 major MSCI indices from Europe, Australia, and Southeast Asia. The 10-year Treasury Note represents debt owed by the United States Treasury to the public. Since the U.S. Government is seen as a risk-free borrower, investors use the 10-year Treasury Note as a benchmark for the long-term bond market. Opinions expressed are subject to change without notice and are not intended as investment advice or to predict future performance. Past performance does not guarantee future results. You cannot invest directly in an index. Consult your financial professional before making any investment decision. Fixed income investments are subject to various risks including changes in interest rates, credit quality, inflation risk, market valuations, prepayments, corporate events, tax ramifications and other factors. These are the views of Platinum Advisor Strategies, LLC, and not necessarily those of the named representative, Broker dealer or Investment Advisor, and should not be construed as investment advice. Neither the named representative nor the named Broker dealer or Investment Advisor gives tax or legal advice. All information is believed to be from reliable sources; however, we make no representation as to its completeness or accuracy. Please consult your financial advisor for further information. Financial Image Notes: All index returns (except S&P 500) exclude reinvested dividends, and the 5-year and 10-year returns are annualized. The total returns for the S&P 500 assume reinvestment of dividends on the last day of the month. This may account for differences between the index returns published on Morningstar.com and the index returns published elsewhere. International performance is represented by the MSCI EAFE Index. Past performance is no guarantee of future results. Indices are unmanaged and cannot be invested into directly.